Mix condensed milk and nestle cream on a bowl. Then on a reactagular dish, pour some cream mixture until the bottom is covered. Lay Graham Crackers on top of the cream. Pour another layer of cream and sprinkle some crushed pineapple. Repeat the process to make 2 or 3 layers. 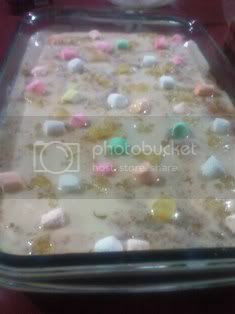 Then on the last layer, top with more crushed pineapple, marshmallows and crushed graham.